It's fairly rare to get papers looking at paddlers and it’s also rare to get papers looking at very highly trained international athletes, so when you get both together it’s worth having a look. I came across four papers by Jesús García-Pallarés (plus various other collaborators) which all look at the training of the Spanish National Team from 2006 to 2008 (the '06/'07 and '07/'08 seasons). The focus varies between them but I thought they were worth looking at together. The first paper looks at the whole two year period and the others look at particular sections within those two years. All with the same group of paddlers. I wasn't expecting this to be such a long post when I started but to tie all four papers together it ended up being fairly long. Since one of the papers considers the whole two year period and the other three look at sections within those two years I've started off with that paper and then brought in the other papers to expand on the sections they each cover. The paddlers in the studies had an average of 11 years training experience at an average age of 26 and paddled 4,415 km per year. All of the paddlers studied had been World Championships finalists. Two of them apparently won gold in 2008; since the only Spanish K2 to win was Saúl Craviotto and Carlos Pérez they must have been in the study! They won the 500 m K2, and Craviotto also won silver K1 200 m in 2012 and gold K2 200 m in 2016 (with Cristian Toro). His coach, Miguel García-Fernández, appears as an author on one of them. Not every day you get to study athletes like that. What training did they do? Before they started they had a five week period where they didn't train and only did “recreational physical activities”. So they had five weeks at the end of season pretty much completely off. Slightly annoyingly, only the first training cycle of each season was analysed, and the two cycles they compared were different lengths. TP was 22 weeks but BP was only 12 weeks. The two different cycles were both divided into three phases (ATP, BTP, CTP and ABP, BBP, CBP). 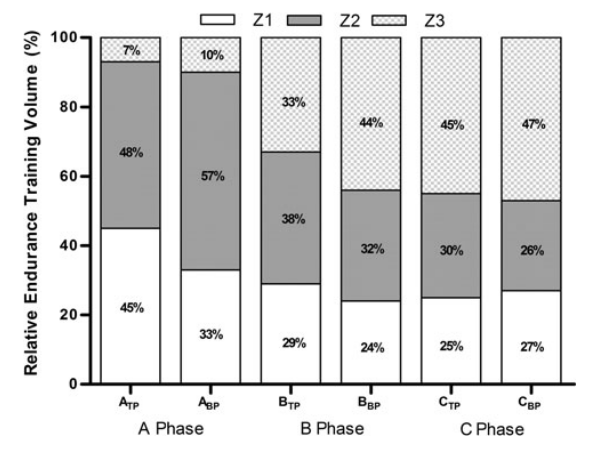 “The ‘A’ phases aimed to develop basic fitness components, such as second ventilatory threshold (VT2), muscle hypertrophy and general technical abilities” “The ‘B’ phases aimed to increase event-specific fitness, such as maximal aerobic power (VO2max ) and maximal muscle strength.” “The ‘C’ phases were tapering phases to improve race-pace and performance for competition.” The paddling program was laid out as shown in Figure 1, with the three intensity zones as defined in Figure 2, and the times spent in each zone given in Figures 3 and 4. Fig. 1 The periodisation plans. Fig. 3 Time spent in the different intensity zones during each training phase. You can get an idea for what they were doing looking at the figures but essentially they started off with more longer steady paddles then moved to a roughly even mix of low, medium and high intensity, then in the third phase increased the high intensity paddles more. Fig. 4 Relative contribution to paddling volume for the three intensity zones. Fig. 5 Strength training parameters. Was there a difference between traditional and block periodisation? The athletes were tested at the start of each phase. On the first day of testing they did a paddling machine test, which was a ramp test starting at 11.5 km h-1 and increasing 0.5 km h-1 each minute while they measured a whole load of things like paddling speed at VO2 peak and second ventilatory threshold. On day two they did a one rep max test 1RM on bench press and bench pull. Day three was a power test with 45% of 1RM, again on press and pull. They tracked loads of things, and most of them came out basically the same after either the TP or BP programs. For example, VO2 max and VO2 VT2 were the same. The main difference they point to is that the BP program was shorter (12 vs 23 weeks) and yet it achieved comparable results. There is plenty of time in the year to do another block or two, especially if you look at the BP program. There's a chance to compound the improvements, so getting the same improvements in less time is quite useful. The thing we really care about is paddling performance, your VO2 max or your bench press are just useful variables to track to see how training is going, and there we find a difference. During the BP cycle they saw increases in Ps peak (paddling speed at VO 2peak) and Pw peak each time they tested them. They could only detect statistically significant improvements from the TP cycle by comparing the start and end, not after each individual phase. They could paddle faster after the BP cycle than the TP cycle, PS peak was 15.4 vs 15.0 km h -1, and Pw peak was higher 254 vs. 240 W. During the taper phase the BP model resulted in increases of 2% in PS peak and 4.5% in paddling power at VO 2peak. However, during the tapering phase of the TP cycle they only managed to maintain Pw peak, and their stroke rate at VO2 max increased (maybe meaning that they were weak and struggling to get the boat running fast). So not only was the training better while they were doing it but coming off the back of the training and into racing they could manage to peak for racing on BP but not on TP. They also had much better race results after the BP training year. In 2007, following the TP year, none of them qualified for the Beijing Olympics; 2007 Worlds results. However, in 2008, following the BP year, four of them qualified for the Olympics. At the 2008 Europeans Javier Hernanz & Diego Cosgaya came 2nd in the K2 1000m while, Carlos Perez & Saul Craviotto came 2nd in K2 Men 500m; 2008 Euros results. Getting statistically significant results with a group of only ten athletes is no mean feat. Sure they measured lots of things and only some came out significant but I think that peak paddling speed and the paddling speed you can hold at VO2 max are probably two of the most important things they measured and they came out improved with the block periodisation plan. Add in that the team performed much better in races in the BP year and I think it's worth paying attention. What did the block periodisation training look like? I’m pretty sure the BP phase from the first paper is the training cycle described in the second paper. In (2) the athletes have an extra year of average paddling experience vs. (1) and the BP phase in (1) is 12 weeks, like the cycle described in (2). The aim of this paper (Endurance and neuromuscular changes in world-class level kayakers during a periodized training cycle) study was to see if the athletes could develop “cardiovascular and neuromuscular markers” at the same time, i.e. could they get both fitter and stronger. It is generally accepted that doing both simultaneously is hard at best and at worst won't really work since they are conflicting goals. Generally getting fitter while doing strength training isn't too much of a problem, but getting stronger while doing lots of cardio is much harder. Sprint kayaking needs both qualities so finding the best way to balance the two is very useful for paddlers. They tried to structure the program to “minimize the possible interference effects in the simultaneous training of the strength and endurance”. To do that they set it up so that “strength training was arranged prior to endurance sessions” or if they couldn’t manage that “sufficient recovery time (6–8 h) was allowed before resistance training”. They avoided mixing training for hypertrophy and maximal aerobic power because hypertrophy training would be attempting to increase contractile protein synthesis in the muscle, while training for aerobic power would require the muscle to increase its oxidative capacity. Since these are conflicting goals they separated them. They put the hypertrophy phase of the gym at the same time as they were doing lots of longer steady paddles. They say that “training at lower aerobic intensities (75–85 % VO2 max) induces more centrally mediated adaptations that would be expected to cause much less interference with muscle hypertrophy”. Simplistically, you're working your heart and lungs when paddling and your muscles with the gym. Then in phase two, when the paddling was more intense and focused on maximal aerobic power, the gym focused on strength which is less metabolically demanding so should interfere less with the paddling adaptations. Fig. 6 Contributions to gym work of hypertrophy, strength, and power to the three phases. Fig. 7 Changes in strength and power performance. In the first phase they trained hypertrophy and they got stronger, but their power stayed the same. In phase two they trained mostly max strength, but they didn't get stronger and while power increased it wasn't quite statistically significant. In the third phase, mostly power training, they got both stronger and more powerful. By the end of the 12 weeks they were stronger and more powerful than at the start. Cardio wise, they got increases in VO2 max during phases 1 and 2 (the phases when they were doing paddles with efforts of 20-90 and 5-20 minutes, then no increases in the last phase, when they were increasing paddling intensity and focusing on race pace work. Shown in Figure 8. Kind of what you'd expect really. Second ventilatory threshold jumped up a lot in phase one, then dropped a bit but stayed higher than it was at the start of the training. Their paddling speed at VO2 max increased in the (final) tapering phase, quite useful for paddling fast! There's been a lot of mentions of the tapering phase, but not much discussion of it, that's where the other two papers come in! Physiological Effects of Tapering and Detraining In World-Class Kayakers, looks at a 4 week tapering phase (the build up to world champs) and a 5 week end of season rest where they either did no training (training cessation "TC" group) or very reduced training (reduced training "RT" group). They were split in to two groups of 7, half in TC half in RT. The 5 week rest is also the topic of the final paper, Post-season detraining effects on physiological and performance parameters in top-level kayakers: Comparison of two recovery strategies. The timetable is shown in Figure 9. Fig.9 The timetable for training, tapering, and end of season break. Tapering is pretty standard practice in all events, as is having and end of season break where little or no training is done. They cite some research pointing to evidence that if you stop strength training you get weaker, and the stronger you are the quicker you loose significant strength. Also that you loose power quicker than strength. All of which fits with my experience and common sense. The aim of the study though is to look at elite athletes who are highly trained in both strength and endurance. For 43 weeks they did a program with a mix of endurance and strength training. Strength training was broken into four cycles of 10–12 weeks, as was discussed when talking about their block periodisation earlier. The taper was four weeks of “progressively lowering training volume while increasing intensity”. By the end of the taper they were doing half of their normal training load. They dropped from three to two gym sessions per week and stuck to only doing bench press, bench pull, and squats: a) one maximum strength session with 90%–95% 1RM (3–4RM) loads, two to four repetitions per set, and two to three sets per exercise; b) one maximal power training session with 45% 1RM (BP and PBP) or 60% 1RM (squat) loads, five to eight repetitions, and three to four sets. They did 5–10 endurance paddling sessions per week. They prioritised high intensity sessions, as you'd expect in the run up to a regatta. The total times spent in those four weeks were 14 hours at 75-90% VO2 max, 4.2 hours at 90-105% VO2 max and 1.5 hours about 105% VO2 max. They lost ~2% max strength in bench press and bench pull during the taper phase, it wasn't statistically significant but any drop isn't good. Its probably worth the trade off for increasing the amount of race pace paddling work though. They did maintain their maximal power output at 45% 1RM though. I'd say that’s a lot more important for paddling performance than 1RM, and more easily maintained by paddling sessions like starts and short efforts. You can see their test results in Figure 10. Fig. 10 Strength and power performance at the end of each training phase. In the five weeks after World Championships the TC group “fully discontinued any kind of physical training” and the RT group did three sessions a week: Monday 40 minute run at ~80% VO2max, Wednesday gym 3*10 reps at 70-75% 1RM on press, pull, and squats and Friday 40 minute paddle at ~80% VO2max. Measures of strength and power increased during the year for both groups (they were all training hard!). In the post season break the TC group lost more strength and power than the RT group. TC lost 8.9% bench press 1RM and 7.8% bench pull 1RM compared to 3.9% and 3.4% for the RT group. Power dropped more than strength, maybe because it is more neurologically demanding and maybe because the training that they did didn't involve any power work. Performance in their power test decreased more for the TC group than the RT group (12.6% vs 9.2% in bench press and 8.3% vs 6% in bench pull). VO2 max also increased during the year for both groups, and dropped more in the TC group than the RT group (-11.3 % vs -5.6 %). Not a surprise, doing a bit of training stops you getting so unfit. Data in Figure 12. Paddling power output at VO2 max decreased significantly in both groups (- 7.9% for TC and -3.9% for RT), but was significantly higher in RT than TC at the end of the period. Keeping a bit of training in stops a lot of the losses in strength and fitness in your end of season break, and it doesn't take much training to make a difference. So what does it all mean for your training? Paddling imposes a fairly uncommon set of demands on athletes. It is rare to see a top level paddler who isn't both fairly strong and fairly fit, sure some lean more to one than another but marathon paddlers don't look like marathon runners and 200 m paddlers are still very fit despite competing in short events. Trying to balance the competing demands is one of the key issues in program design for paddling. Based on the research looked at here it seems like the following pairing in a training phase of a few weeks might be a good idea: Long steady endurance phases on the water (75–85% VO 2max) + hypertrophy gym (8-10 reps, 4-5 sets). Centrally mediated vs peripherally mediated Paddling focused on maximal aerobic power (most paddling efforts in the 1-20 minute range + gym focused on either strength (3-4 reps, 3-4 sets) or power (5-8 reps, 4-5 sets, 45% 1RM). Metabolic / muscular adaptations vs neurological. There's other ways to structure a program taking account of the competing demands. You can focus on paddling for a short phase, with gym just being maintained, then alternate to a phase focused on gym while paddling is just on maintenance. That also means that you aren't trying to adapt to two things at once, and you put the main focus of your time and energy in to one or the other. At the end of the year it is probably a good idea to have a few weeks of reduced training but keeping just three easy sessions per week can stop a lot of the strength and fitness losses while keeping all the physiological benefits of an end of season break. They only really discussed the first training cycle of the year in the papers here. Different times of the year will need more focus on different areas. Also, different people have different strengths and weaknesses they need to work on so everyone will have to tweak programs to some degree. Hopefully there's some things to chew over and try implementing in your training though. Note: there are bits of information dropped in to the discussion about one paper that are confirmed and expanded on in another paper. I haven't referenced every time because it would get annoying, but all of it is taken from the combination of the four papers. For example paper 3 just says they did two endurance sessions of paddling or running at ~80% VO2max, but paper 4 gives more detail and says a 40 minute run at ~80% VO2max on Monday and a paddle on Friday.